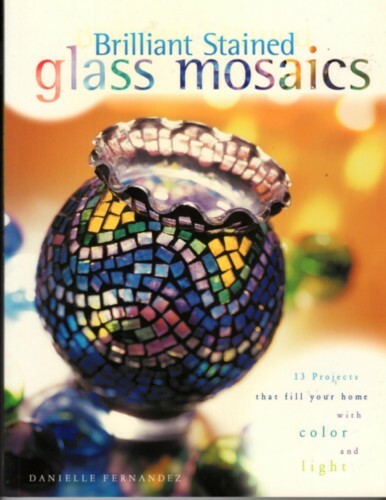 North Light Books Brilliant Stained Glass Mosaics craft instructional softcover book. 128 pages. Danielle Fernandez. Chapters include Basic Toolsand Materials, Basic Techniques, Projects: Iridescent Vase, Seaside Picture Window, Mosaic Candlesticks, Star and Moon Lantern, Mosaic Votives, Tulip Night Light, Mardi Gras Vase, Hurrican Lamp, Geometric Stained Glass Window, victorian Angel Ornament, Rolled Glass Vase.